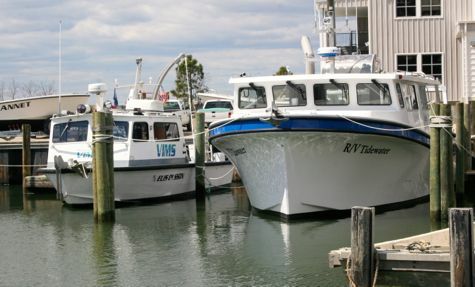 Field Operations at the Virginia Institute of Marine Science provides a broad range of technical services to the scientific community in addition to maintaining and operating VIMS' fleet of research vessels. The technicians, machinists, welders, fabricators, and mechanics on staff can design, fabricate, and repair complex electronic and mechanical instruments and tools. They can also assist in designing field programs, operating vessels, and conducting field work, either locally or away. Contact us for details. The Institute's research fleet comprises more than 30 small boats and several larger vessels staffed with dedicated crews. Learn more by clicking the drop-downs below. 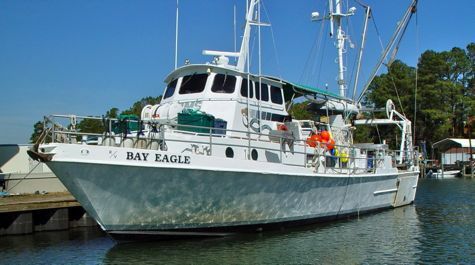 The 65-foot R/V Bay Eagle is outfitted with a wet lab containing a flow-through seawater system, and a dry lab housing the electronics. It has 2 boom winches and redundant hydraulic systems to accommodate a variety of scientific needs and data collections. The R/V Bay Eagle also uses interchangeable stern decks, which increases its versatility when shifting from trawling, to dredging, longlining, or other applications. The 43-foot R/V Tidewater was added to the Institute’s research vessel fleet in May 2013. The R/VTidewater replaced the 29-foot R/V Fish Hawk as the primary platform for VIMS Juvenile Fish Abundance Survey. The R/VTidewater’s design and capabilities allow broader use of the vessel beyond the trawl survey, helping the VIMS community accomplish whatever tasks are needed to serve the Commonwealth. The R/V Tidewater features a hydraulic A-frame for deploying trawl nets and other sampling equipment, an open rear deck for efficient sampling, and a separate enclosed space for lab work. The vessel is capable of speeds up to 18 knots and is equipped with top-of-the-line electronics. The 93-foot research vessel Virginia—purpose-built for the Virginia Institute of Marine Science in 2018—is available for use both by VIMS researchers and external parties. It offers flexibility in science outfitting, rapid turn-around for frequent use, and affordable operation. The vessel is easily adaptable to evolving scientific research areas such as environmental impact studies, the servicing of ocean-observing systems, and offshore-energy exploration and development surveys. Our fleet will be expanding when we put into service our newest vessel the 36' passenger-for-hire M/V Tyndall Pointe, expected to be officially added to the fleet during the upcoming year. The diving facility includes a diver training room and classrooms to support the VIMS Dive Team. The VIMS diving program is an organizational member of the American Academy of Underwater Sciences.